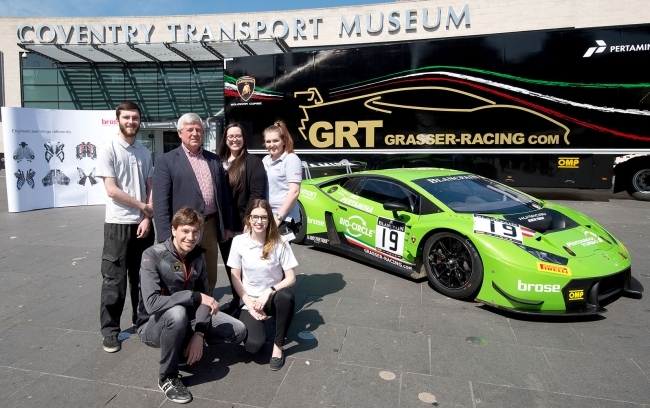 One of the leading stars of GT Motorsport raced into Coventry recently with a clear message to get more young people involved in Science, Technology, Engineering, Arts and Maths (STEAM). 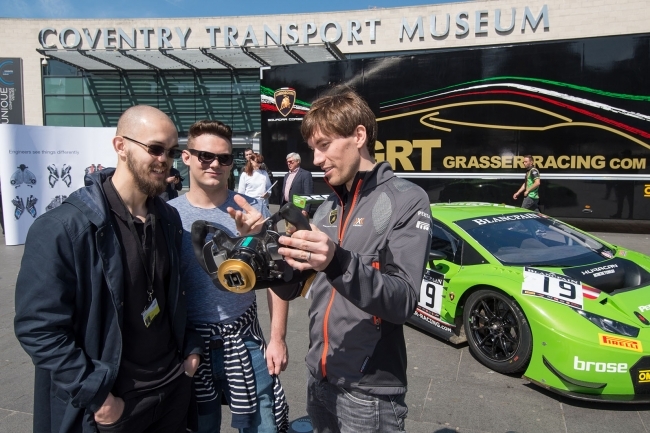 Christian Engelhart, the factory driver for Lamborghini, marked his ongoing sponsorship deal with automotive supplier Brose by meeting hundreds of people at a special event held outside Coventry Transport Museum. The current leader of the Blancpain GT Series chatted to fans, posed for photos and gave youngsters the opportunity to be motorsport stars by sitting in the Lamborghini Huracan GT3 he is currently racing. He also used the opportunity to talk about his own love for manufacturing, his degree in Mechanical Engineering and how important teamwork is in ensuring you get the most out of the car. “If you are passionate about making things or working with the latest technology, there are few better careers to explore than engineering and manufacturing,” explained Christian, who acts as an ambassador for Brose. He continued: “The event was great fun and it was good to meet with some of the young apprentices and graduates at Brose UK and talk to them about their own careers and what they wanted to do. The special event was held as part of Brose UK’s ongoing relationship with Coventry Transport Museum to get more young people interested in Science, Technology, Engineering, Arts and Maths (STEAM). This includes sponsoring a Learning Officer, who will engage with over 12,000 12-16 year-olds in a range of educational activities, including working on a land speed record project, recycling materials to make new machines and the Young Inventor’s Club. Petra Hladka, Director Human Resources at Brose UK, explained: “We are very passionate about developing the next generation of engineers and recruit new apprentices and graduates every year, some of whom were at the event this week. Brose UK, which manufactures window regulators and seat structures for international carmakers, employs almost 1000 people in Coventry. Following his appearance at the museum, Christian travelled to the company’s plant in Exhall and spent two hours meeting with employees and answering questions about his career and the current Blancpain GT Series. He also held a briefing with the firm’s Karting Team ahead of the UK Corporate Games in the summer, providing useful tips on how to make it on to the podium.